In order to complete the Goron Quest, you need to perform six special Kinstone fusions. The reward for finishing the Goron Quest is a bottle. The Goron's cave is located around the south west area of the Lon Lon Ranch, once all the Kinstone fusions are done go there to claim your reward! Go to the eastern hills and visit the two farmers, Eenie and Meenie (they wear large hats, and are digging and planting crops). Talk to Eenie and fuse kinstones with him. Right next to Eenie and Meenie is a cave. Dig it out with the Mole Mitts. Dig through the cave and go to the very top right hand corner. You will notice a strange symbol on the wall. You will be able to fuse kinstones with it, do just that. You need to go to the very top left hand corner of Mt. Crenel. From there, climb down the ladder onto the platform and dig out the blocked up cave with the Mole Mitts. Inside this cave is another symbol which you need to fuse Kinstones with. Go to the area in Tribly Highlands where the path which leads to Mt. Crenel is. Just north of this path is another cave you need to dig out, and another symbol you can fuse kinstones with will be inside. 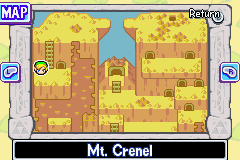 The cave containing the symbol is located in the northern Minish Woods, just near Syrup's Hut. There are two ways of getting there. 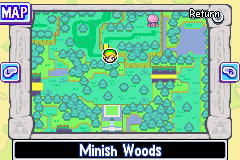 Firstly, you can enter the Minish Woods via the Eastern Hills and swim past the small pond of water. 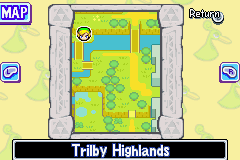 You can also start at the Lon Lon Ranch, enter the southern entrance to Lake Hylia, and then go south into the Minish Woods. 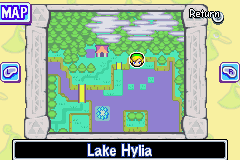 Go to Lake Hylia and start at the Mayor's Cabin. Swim up north, and onto one of the shallow parts of the water you can stand on. You will need to go further north, jumping from platform to platform, to reach the cave because there isn't a stairway by the cave which allows you to climb out the water.